An agenda for the upcoming meeting prepared by the club President . There will also be a column, A WORD FROM THE PRESIDENT, that includes thoughts, observations, ideas, etc. A variety of other news categories. The Field Trips chair will provide the field trip agenda for the month and perhaps a report on the last trip. A “How To” article offering quick and fast, uncomplicated procedures for adjusting and fixing photos under TECH TIPS. Under GOT NEWS? members will have the opportunity to write in on their latest activities, trips, finds, and other interesting stuff. There is also be a USERS REPORT where members can write in their recent good deals, experiences -- good or bad -- with gear or services. Under FOR SALE members can list items for sale or their wanted items. Under LETTERS TO THE EDITOR members can write about their concerns, wishes, ideas or other comments about the club. All information that, you, the member, submit should be sent to NVPSNEWSLETTER@gmail.com by the newsletter's deadline: the 15th of each month. The information will be compiled and published in the monthly newsletter and sent out to all as an e-mail attachment before the monthly meeting. 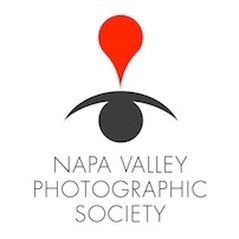 The Napa Valley Photographic Society's official logo was created by internationally renowned and award-winning graphic designer, Jim Cross. Cross, an NVPS member, donated his time and talent to this creative task.  Is there a sense that this is a visually pleasing photograph?  Does it follow the Rule of Thirds?  Does the subject stand out, or are there unnecessary distracting elements in the photo?  Is the horizon level?  Does the subject fill the frame, or would it benefit from cropping?  Observe the foreground and the background. Did the photographer use depth-of-field effectively?  Are there leading lines that take your eye to the subject?  Is there a nice texture throughout the image?  Is the subject in the photo in focus?  Is it properly exposed?  A good exposure means that you have some amount of detail in shadows.  Does it have too much digital noise?  Is the photo over-processed in post-production?  Did the photographer choose the right lens and shoot from the best possible vantage point?  Are the colors accurately represented?  Is the lighting "flat" with no contrast in different elements?  Does the photo tell a story?  What kind of impact does the photograph have on you?  What do you like about it?  Is it an emotional shot, a statement, or humorous?  Also remember that there's no right or wrong in photography. The Rule of Thirds, for example, can be broken with beautiful results. Consider which elements turn a snapshot into a stunning photograph. Being objective and identify the strong points of the images, but also remember that adverse remarks should be stated in a manner so as to indicate how the image might be improved. Good judgment and common sense goes a long way and should be used at all times. Choosing 12-15 of your best shots is not an overwhelming number and helps to really show where you strengths lie. A good comment goes something like this... saying "I like the sky" is useless. "I like the color of the sky" is better. "I like the deep blue color of the sky because it contrasts nicely with the yellows and reds in the photo" is perfect. Put some thought into it, and keep it positive! NVPS member Philip Venable gave a step-by-step presentation on how to create HDR photos from the field to the digital darkroom. His instruction was enhanced by a PowerPoint presentation including screen shots of processing photos using Photomatix and HDR Efex software programs. To download the PowerPoint presentation click here. PhotographyDegree.com has a compilation of resources including articles that will let you learn everything you need to know about getting a degree through the Guide to Photography Programs. This includes the classes you will have to take to earn a photography degree and the job outlook for photography professionals. The Napa County Library, which hosts a monthly travel series called Remarkable Journeys, is putting out a call for presenters. The Remarkable Journey's program is an opportunity for members of the community to hear the stories of other community members as they travel their own remarkable journeys. The program is on the third Thursday of the month beginning at 7 p.m. The presentation lasts about an hour and includes time for questions from the audience. Presenters tell about their trip and the impact it has had on their lives. Sometimes these are pleasure trips that have been long planned and were the trip of a lifetime. At others have been trips for humanitarian purposes, where community members have traveled to places to provide medical assistance. Both types of experiences have been presented at the library. Many topics can be covered in the presentations and images help to tell that story. The audience is interested in hearing about the pleasures of the journey, but they also want to know about the challenges faced and how they were overcome. What kind of interesting food and drink experiences were there? What did the traveler find intriguing about the location and the people encountered? What impact did this experience have on the traveler? In a recent presentation about traveling on the road to Compostela, the audience was interested in the gear the speaker took, the accommodations, how long it took to walk. Each journey is different so each trip will have details specific to that journey. Those interested in presenting a Remarkable Journey should contact Stephnia Pramuk at (707) 253-4223 or at Stephnia.Pramuk@countyofnapa.org.